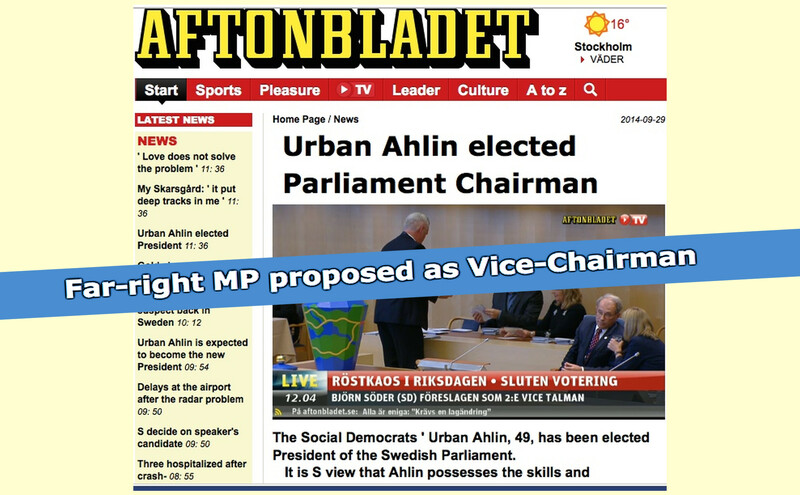 The Professors’ Blog notes with certain relief that today’s election at the Swedish Parliament (29 September 2014) chosen MP Urban Ahlin as Chairman of the Parliament, for this means that Mr Ahlin shall NOT be the next Sweden’s minister of Foreign Affairs (see texts below). In other words, there is still hope that Carl Bildt’s policy – alien to the interests of Sweden and peace in Europe – will be replaced at the Foreign Office. The Swedish Parliament is in the process of electing MP Björn Söder (SD) as one Vice Chairman. He is expected to be confirmed after the third round of voting, this afternoon. The head of the Left Party (Vänsterpartiet) Jonas Sjöstedt, declared in video-interview with Aftonbladet at the Parliament that they oppose that Sweden will be officially represented, even abroad, by someone that has expressed racist and homophobic stances. The most outstanding finding in the recent Swedish national elections has been the impressive increasing of the Sweden Democrats Party (SD). 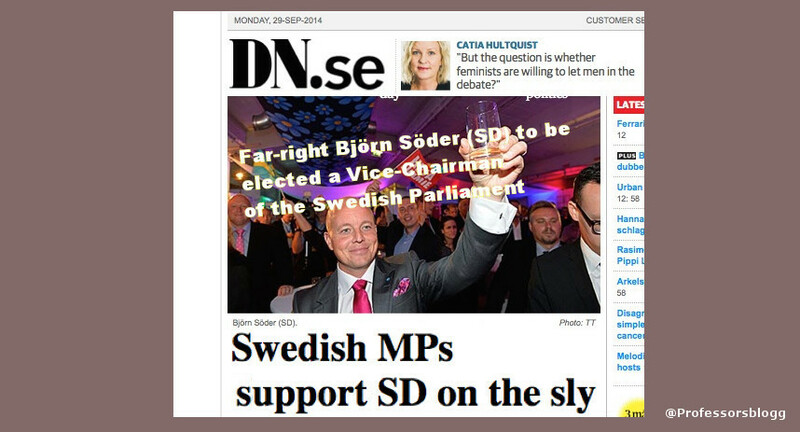 SD is a right-wing conservative and nationalist political organization, who even the right-wing liberal paper DN categorized today as a “Fascist Party”. In fact, the party recorded a grown of voting-supporters of over 13 percent with regard to the past elections. This makes SD the absolute fastest growing political party in Sweden. 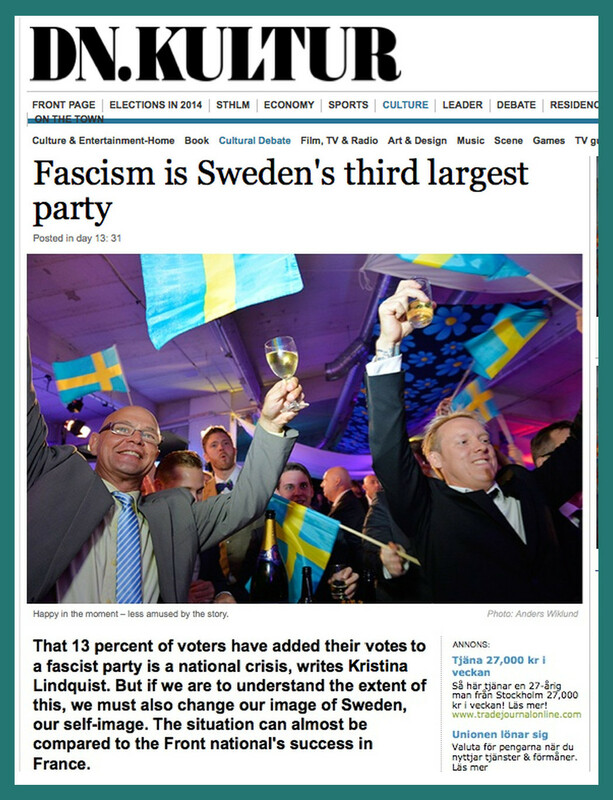 Professors Blog’s have translated excerpts of this analysis by Kristina Lindquist [“Fascismen är Sveriges tredje största parti“], published in DN today 15 September 2014. What the power-shift in Sweden means in terms of foreign policy? In geopolitical terms, the change in the political coalition in power, led by the Social Democratic Party, will not mean – unfortunately – major changes in the international stance of Sweden. Although the bases for the foreign policy advocated by the other two members of the Center-Left coalition, namely the Greens and the Left Party, is different from the social-democrats, these parties do not have the political strength to change the course of event of the new Swedish government. On principal aspect in this regard is the continuing allegiance pf Sweden towards the imperialistic geopolitics of NATO. The Social democrats have said they will go ahead with Carl Bildt’s initiative of offering NATO the soul of Sweden for manoeuvrings during peace-time, but also as a transit or landing facilities in the case of war. Making things worse for the international credibility if Sweden, Mr Peter Hultqvist – the Social Democratic Party’s spokesman on defence issues – declared to Swedish Radio: The new NATO agreement is not a breach of “Sweden’s non-alignment stance”, because is Sweden who invites NATO; it is all under Swedish conditions.” [“Det bygger helt på att det är Sverige som bjuder in. Det är Sverige som avgör vad som ska hända. Det sker alltså på svenska villkor och strider inte mot alliansfriheten“.]. The Green Party has vividly opposed such initiative. In fact, this party has opposed similar other measures adopted by the Bildt/Reinfeldt government, but NEVER succeeded to go beyond statements to the media. 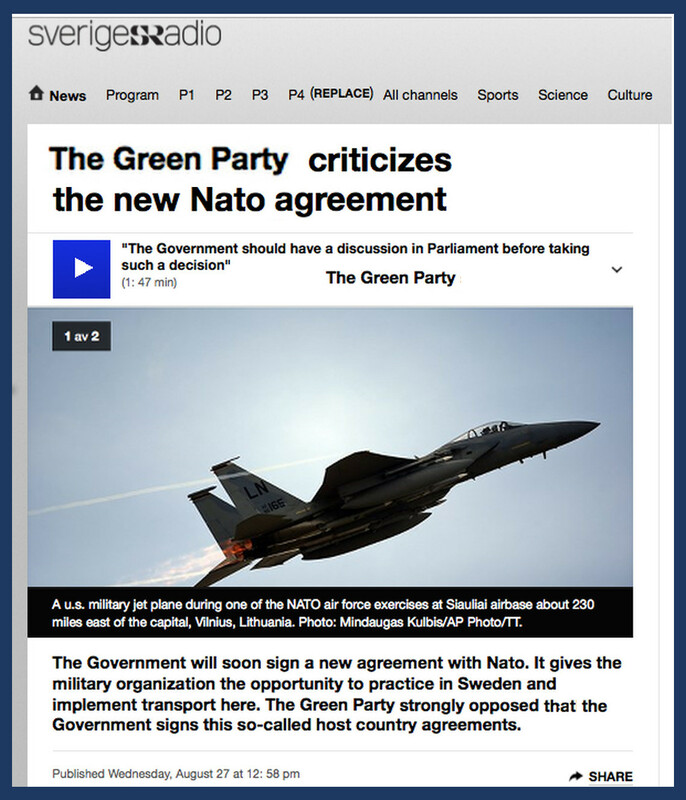 As for the “Left Party”, formed by the ex Swedish “communists” and other progressive forces, they have even voted at the Parliament in support of Carl Bildt proposition of sending the Swedish Air Force a flotilla of Jas jet-fighters) to Libya under the command of NATO, practically the USA. All the Swedish political parties (in fact, only the Sweden Democrats opposed) agreed with such proposal of Carl Bildt, in harmony with Sweden’s pro-NATO stance. See on this regard my analysis “Swedish government affirms is not militarily aligned. Facts severely contradict“. The past Swedish government has counted with the staunch support of the Social Democratic party for every single military intervention abroad under the US command. That was the case for instance of Afghanistan. A fact that would guarantee the continuation of the same Cal Bildt’s foreign policy – in my opinion, a disaster for Sweden’s national interests – would be if the Löfgren government appoints Mr Urban Ahlin, a current spokesman for foreign affairs at the Social Democratic Party, as the new Swedish foreign minister. Mr Ahlin, similarly of the case Carl Bildt, has also been identified by WikiLeaks documents as a “secret visitant” to the Embassy of the United States in Stockholm, in search for advice and agreement. Ahlin has denied that. “Twenty years is no time in politics. And the party which is today Sweden’s third largest, pursued for two decades ago campaigns with warnings to Swedish girls: “Shame not your race, your Sweden, your family and relatives.” In interviews, the party’s main representatives spoke about the unnatural and “non-Swedish” of adopting children from abroad: “it looks disgusting when you see two parents with an Indian kid between them.” in the early 1990s, at the Karl XII demonstrations, the Sweden Democrats went side by side with activists from the Nazi terror-group White Aryan Resistance. There’s a word for this: Fascism. And a situation where thirteen percent of Swedish voters adds its vote to a fascist party cannot be described as anything other than a national crisis. So far, the Swedish self-image stops the way towards that insight. This is not us, what we are is something else. Kristina Lindquist, “Fascismen är Sveriges tredje största parti“, DN, 15 September 2014. Well, won’t be visiting Sweden..